You have given us a pledge of your protection. Greetings to you all as we celebrate Carmel’s great Feast of Our Lady of Mount Carmel. This feast is not only for Carmelites, but is beloved by all of Mary’s children, since so many of them wear her Scapular with affection and loyal devotion and form the worldwide Confraternity of the Scapular. Many have called this day the “Feast of the Scapular of Our Lady of Mount Carmel,” so attached are they to this emblem of the Blessed Mother’s tender solicitude and guardianship over her children. And with good reason, since for over 700 years she has used this sacramental to convey the graces God so desires to give to the world. On July 16, 1251, Mary appeared to St. Simon Stock surrounded by angels and holding in her hands the brown scapular of the Carmelite habit. “This shall be a privilege for you and for all Carmelites: whoever dies clothed in this garment shall not suffer eternal fire, rather, he shall be saved,” she promised. These words are kept in reverent memory by all who wear the scapular with faith and hope. Saint Claude tells us, “Of all the pious practices which have inspired the faithful to honor the mother of God, there is none so sure as that of the Scapular. No other devotion has been confirmed by so many and such extraordinary miracles.” A few of these miracles are recounted in the little book called Garment of Grace. Pope Pius XII exhorted the faithful to wear the Brown Scapular as a sign of consecration to the Immaculate Heart of Mary, and said, “Truly, the holy Scapular, being the habit of Mary, is a sign and a pledge of the protection of the Mother of God.” It is edifying and encouraging to read what other Popes have said about the holy Scapular. 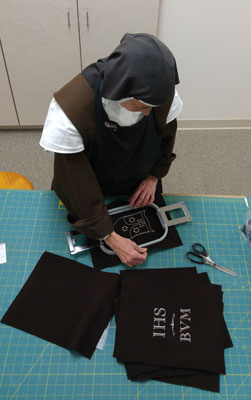 Speaking of our Lay Carmelite friends, we have finally acceded to a very frequent request of theirs to make Ceremonial Scapulars for them. This scapular is much larger than the small one generally used and is often worn daily, as well as for the Carmelite Chapter meetings, ceremonies and liturgical functions. We now offer this scapular in wool, either plain or embroidered. Through our wonderful friends in France, we are now offering quantity discounts for crucifixes, including profession crucifixes for religious and third order members (Carmelite, Franciscan, etc. ), as well as a number of other devotional crucifixes. This wonderful, family-run business has been making crucifixes for over a century, and we are pleased to be able to present and provide them for the faithful. We have recently added to our illuminated prints the matchless message of confidence of our Holy Mother, St. Teresa: “Let nothing disturb you…” These hand-gilded prints are one of our favorite items, since they blend quality artwork with spiritual messages. The other Carmelite Illuminated Print is a prayer of St. Therese of the Child Jesus. One of the Sisters recalls from her childhood a little mountain town her family visited each summer for a celebration the townspeople called “Christmas in July”. There would be an early morning Mass at the little Catholic church in the town, and then the rest of the day would be a celebration with games small presents for the children and food for everyone. The pastor would lead the Rosary in the afternoon in honor of the Joyful Mysteries. He would give a little talk to the children about how we should never forget the Child Jesus and all He has done for us, no matter what time of year it was. In the spirit of that little town’s celebration, we are offering a “sale” on our Christmas items. We hope to make a little room for new Christmas items coming in the fall. It has been a beautiful spring, and we have benefited from the boost the almost-daily rains have given our roses and other flowering perennials—and everything is so green! 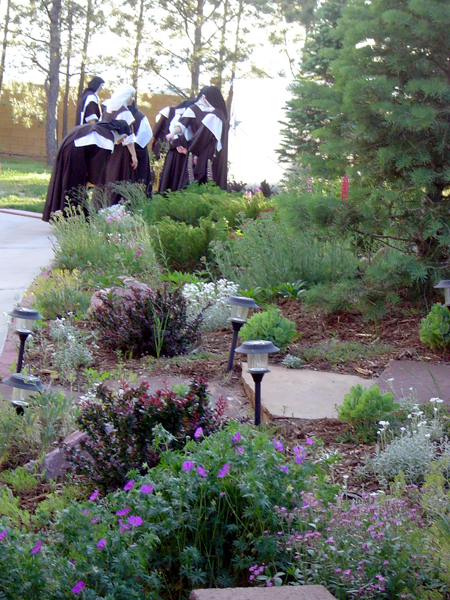 Quite rare for Colorado to have such help this time of year, and we are grateful to be assisted by this blessing in our labors to keep the enclosure beautiful. In the midst of some of those labors, one of our Sisters broke her foot. 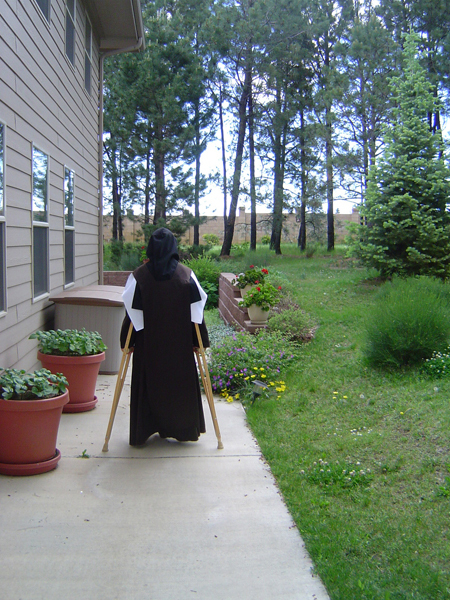 It was interesting to see crutches beneath the arms of the Carmelite habit, as Sister hobbled around the best she could for 6 weeks or so. The Sisters got to calling her “Sister Limp-Along”, “Sister Amahl” and so forth. (Amahl is little the crippled boy of Minotti’s Christmas opera, “Amahl and the Night Visitors”—about the Three Kings who, in their travels stop to rest at the home of a poor woman and her crippled son.) Our crippled Sister delighted in taking a little revenge, when on a certain Sunday the Gospel was of Our Lord’s parable about the ill-attended banquet and the master’s invitation reverting to the “poor and the crippled and the blind and lame.” Sister is doing much better now! Our works continue apace, and we seem never to be finished with the “List of Projects”. We are presently working on a red vestment that will have on it an antique, hand-embroidered appliqué of St. Catherine of Alexandria. This work of art is at least 50 years old, but probably closer to 100. Intricate cutting work is before us, as well as a bit of our own embroidery to make the wheel larger. Although we are always working on vestments of some kind or color, we must also always be refusing additional work of this kind. 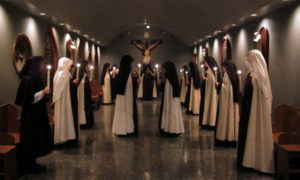 There is such a demand for this holy work, but the Carmelite life is not one that can include such commitments on a regular basis, which would compromise our most important work of prayer. So we do them as we are able and feel so privileged to do at least what we can, a few vestments per year. We recently acquired an industrial iron, which helps greatly with the pressing of the large pieces of fabric needed for vestments and habits. We have discovered that this iron serves a double purpose: it presses twice as fast and ever-so-professionally—and, putting out its billows of steam, it provides a built-in penance during the heat of summer! But each little sacrifice reminds us of so many souls who are in need of the offering. It is farmer’s market season, and good friends are donating many of the greens and vegetables that come through the turn, grown at local farms. There is nothing as delicious as fresh produce locally grown! Each week, we bring in the bags of green stuff and get to work in the kitchen—sorting, washing, cutting and storing—and maybe cooking. It is a big job each week, but we are so grateful for this generous gift from God’s harvest. In the midst of the many “projects” and “business” of running a monastery, the steadying work of daily prayer and sacrifice keep us closely united to God and to His work of running the world. Never far from our thoughts are the sufferings and worries of the world. How can we forget those at war, those in hunger, those in fear and anxiety, those laboring against evil and struggling against temptation, those in sin? When St. Paul wrote, “Bear one another’s burdens, and so you shall fulfill the law of Christ,” he was well aware of the great work of prayer, penance and sacrifice needed to help save souls—itself a humbling yet privileged burden. So we continue, by God’s grace and help, our day-to-day attempt to labor with Him for the salvation of souls. May Our Blessed Lady, Queen and Mother of Carmel, be with us at every step, bestowing her maternal assistance at every moment! Assuring you of our remembrance of you in our prayers each day—especially today, during Exposition of the Blessed Sacrament, Mass and Divine Office for this beautiful Feast.